Online learning is growing. It is growing quickly compared to other enrollment where overall college enrollment has dropped. This is true both in the higher education sector as well as in the K-12 sector. 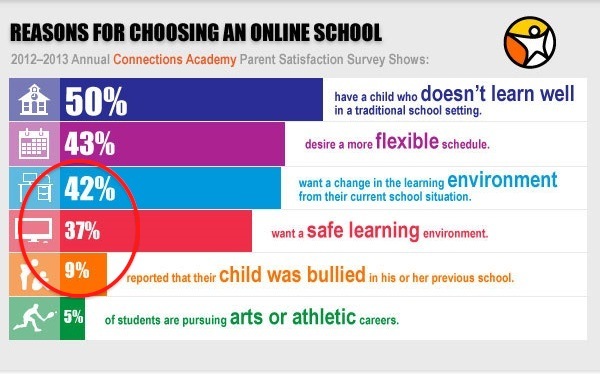 The question is why are students and parents continue to flock to it? There are a few boilerplate reasons consistently cited: flexibility of schedules, no commute, workplace subsidization, easy means to degree completion, etc. I am interested in a few other reasons for this growth and one struck me as a statistic we should look at more closely in the coming years: bullying. That is a lot of desire for change in environment. What is going on in our schools then? It might not be just the curriculum but the places we are sending our kids. Would you send your kid to a babysitter’s house where you really aren’t sure what happens there? All you know is that the parent comes in once in a while to make sure things are ok. Most of the time the babysitter doesn’t have time to watch all of the kids and the kids are free to do what they please. Yet that’s what happens in schools all over the country. Our kids go there for up to 10 hours a day if they are in extra-curricular activities. We don’t get to see what is happening there. If this data is correct, as a society we are trusting the school less and less to offer a safe learning and social environment for our kids. Think about it. What kind of environment are you comfortable leaving your kids with? During the week, they are there more than they are with you. ← What is a Mind Squirrel? Looking at this just makes me want to throw up. It makes me sick seeing all these kids so desperate for an environment they can feel safe in. It is a problem. There is still a need for in loco parentis in education. Unfortunately that was scrubbed in the 20th Century. Now we are fortunately starting to come around to that idea again in light of recent tragedy. Unfortunately it often takes tragedy to wake people up. It’s shocking to me how we are considered the most intelligent life forms on Earth, but so many people are blind to the problem, or are allowing their children/family/friends to ‘toughen up.’ It is a problem. Support is needed to help.